Let's talk about Artifact. The card-based battler was shown off to the public for the first time last weekend at PAX West, and I got to go hands-on with it during the show and speak with a couple of the game's developers. It's significant mainly because it's the first major Valve game since DOTA 2 in 2013 (VR toy The Lab released in 2016, but virtual reality is still too niche to consider this a major release). The title has been in development since 2015 but wasn't revealed until August last year, to some disappointment. Collectible Card Games (CCGs) aren't for everybody, and if you don't like other games of this type Artifact probably won't change your mind. On the other hand, if you're already a fan of card games Artifact should be right up your alley. 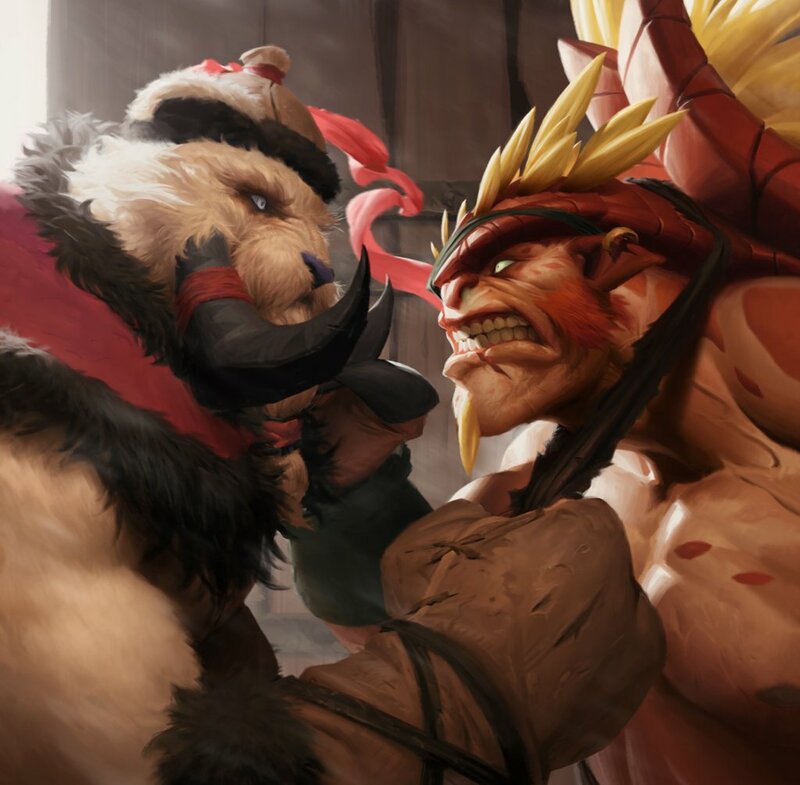 Artifact is set in the DOTA 2 universe, and all of the characters and ephemera surrounding the game should be familiar to those who've played Valve's MOBA. Fortunately, deep DOTA knowledge isn't necessary to play, and I got along fine even though I've never played a match of DOTA 2. The card game borrows from several titles that've come before, but most of the mechanics can be traced to CCG progenitor Magic: the Gathering (MTG) and Blizzard's Hearthstone, with just a dash of DOTA 2. The former influence shouldn't surprise anyone, especially since Magic creator Richard Garfield is spearheading this project. From MTG we get the idea of multiple colors which have different themes, spells and abilities which have a color cost associated with them, and a timer that allows players to react to spells and abilities used on the other side of the board. From Hearthstone comes the turn-based increasing mana ramp that prevents mana flooding or mana screw, and damage that stays on cards even after battle is concluded. And DOTA 2 lends the concepts of multiple lanes to attack or defend, a shop with powerful items that can swing a game, and towers to destroy by overwhelming your opponent's forces. 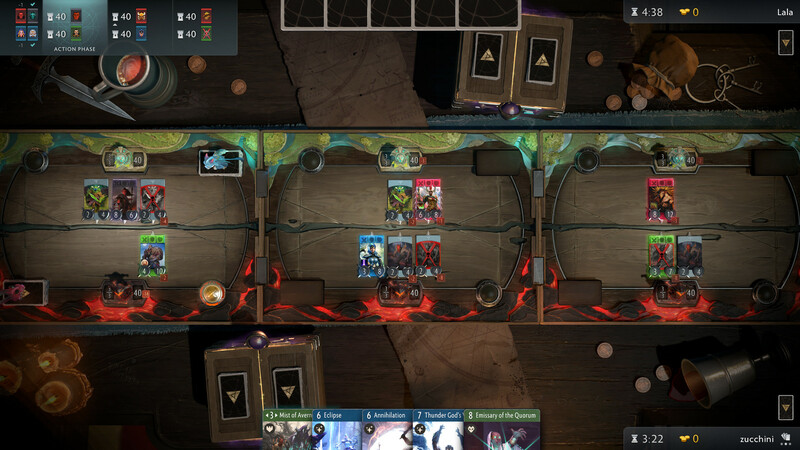 Artifact's unique hook is its three-tiered playfield, which requires players to keep more interactions in their head than the comparatively simple playspaces of MTG or Hearthstone. I asked Garfield about this, and he told me that the ideal way to play Magic (and the way things are done in tournaments) is to play a series of three games, with the winner the player who can beat their opponent in two out of three matches. Artifact, he explained, essentially forces you to play three games at once. There are four colors in Artifact which correspond to four types of fantasy characters, and each of the game's heroes is aligned with one of these four colors as well. Green is associated with Clerics and Druids, and has more healing options. Black is the color of Rogues and Assassins, and tends to have easier ways to remove creatures and heroes from the opponent's side of the board, or generate currency. Blue corresponds with Wizards and Sorcerers, and these heroes focus on dealing direct damage. Finally, Red cards are linked to Warriors, and these favor weapons and martial abilities. Most spells and upgrades have a color cost, and can't be used unless you have a hero of the appropriate color on the board and enough mana to cast it. Up to two heroes are placed at the beginning of every turn if you have any available; when defeated they leave the board for one turn before being able to respawn. Placing them is a double-blind affair, and anticipating your opponent's moves is a huge factor in how a game will play out. Since heroes also allow spells of their color to be played, they act as sort of a resource in addition to their threat on the board. Playing around your opponent's heroes and maintaining your own makes for some fascinating counterplay, and there are always decisions to be made, whether to write off a lane as a lost cause, or try to defend long enough in one lane to shore up a different strategy in another. Decks can have heroes of just one color or choose to incorporate up to all four, depending on the player's preference. Just like in Magic, specializing in one or two colors provides fewer options, but makes it far more likely you'll draw something you can play every turn. With 44 heroes to choose from in the base set, theorycrafting and building a deck around your favorites will be a huge part of the gameplay. In addition to the mana and color resources, players earn money by defeating enemy creatures on the board. Every turn, colorless creatures called "Creeps" spawn on both sides, and if your heroes or friendly creeps defeat them you'll earn a monetary reward. Between rounds each player has the option to buy some powerful artifacts from an in-game shop, and attaching weapons or armor to your heroes can make them much more formidable. Some of these are one-shot items which can do things like fully healing a friendly target, but most are equipment. These artifacts remain on the heroes permanently and come back with them when they return from death. Weapons tend to increase heroes' attack value, but can also grant abilities like Siege (extra damage dealt carries over to the defending player, like Trample in MTG) or Piercing, which ignores an enemy's armor value. One of the developers I was talking to mentioned some advanced strategies which involved deliberately killing one of your beefed-up heroes so that you could place it in a different, less well-defended lane and tear through the weaker opposition. Many of these artifacts make a hero incrementally more powerful at the beginning of every turn, so failing to deal with a hero early on can end up biting you later. In addition to their value as attackers, defenders, and a color resource, heroes can also add a "signature spell" to your deck which can have a significant impact on the state of the board. Blue spells might do things like dealing four damage to everything in one lane, while a Green signature spell can heal the whole lane and make it impervious to damage for one turn. Decks are limited to three of any one card per deck, but a hero will bring three copies of their signature spell along with them. There's a lot going on in any given game of Artifact, and keeping track of everything can be intimidating. That's where the clock comes in-- each player has a fixed amount of idle time allowed, and if they burn through all of it, they lose immediately. This should help keep players from trying to stall a match, but gives the option to take more time during a turn to consider tactics if you really need it. One other interesting interaction is the way in which turn priority is handled. Instead of Magic's system of instants and interrupts, players are given the opportunity to react to their opponent's plays one at a time. Either player can pass their initiative by taking no action, and doing so will let you take priority in the next lane. Sometimes it's more important to have the initiative elsewhere in the match, and sometimes it's more important to take out a target before it gets a chance to attack. Each round is interlaced with players taking turns reacting to one another until combat is decided, and then play moves on to the next lane. Artifact's presentation is quite nice, and even though there's a lot to keep track of the user interface does a great job of keeping the player informed. You can check out any lane at any time, and the animations are smooth and easy to follow. 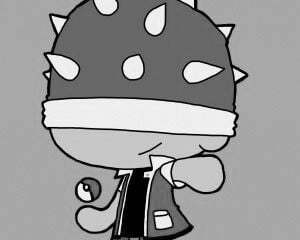 Cute dragons accompany you from lane to lane, cheering when you do something good and covering their eyes when you take a big hit. 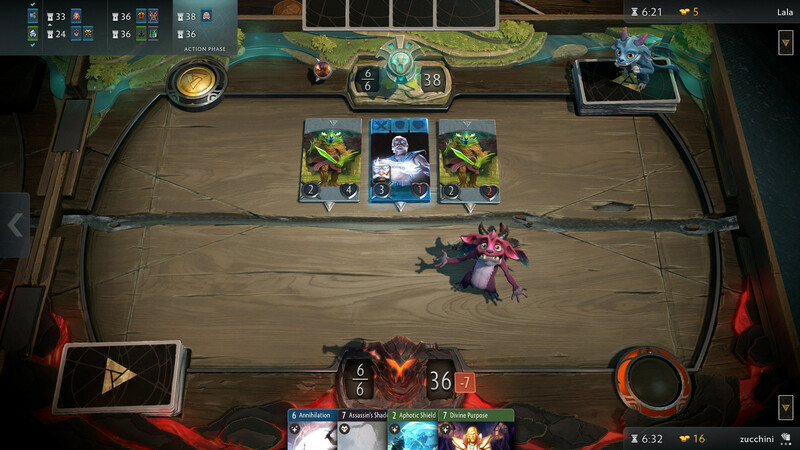 Unlike Hearthstone or digital versions of Magic, Artifact will use the Steam marketplace for trading, and this feature is what attracted Garfield to the project in the first place. This should help keep individual card costs down since players will be able to trade for what they need, and can even trade items earned in other games to flesh out their decks. I asked if the team is trying to prevent players from being able to pay to win the game, and was told that there are some systems in place to help combat this. Common cards are designed to be extremely relevant to gameplay, and there are only three tiers of rarity (common, uncommon, and rare) with one rare card guaranteed in every pack. 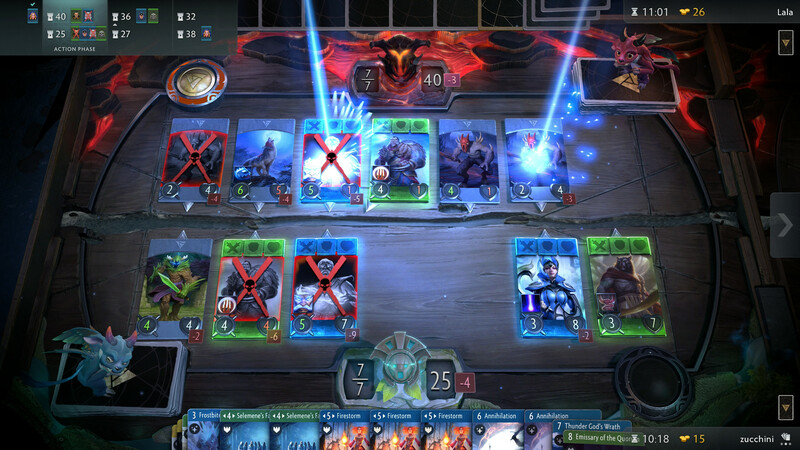 Cash spent on card packs will be one of the main sources of revenue for prize money, and Valve intends to sponsor Artifact tournaments and encourage it as an eSport. Garfield said that players will be able to apply custom rules to games played with friends, and that the concept of friendly "kitchen table" Magic games is one of his team's goals. They also want to make the game new and significantly different from competitors, since games like Hearthstone, Eternal, and Magic Arena already do what they do at a high level. Valve expects to support Artifact for at least a decade, and the game will introduce expansions at regular intervals even though none are scheduled just yet. 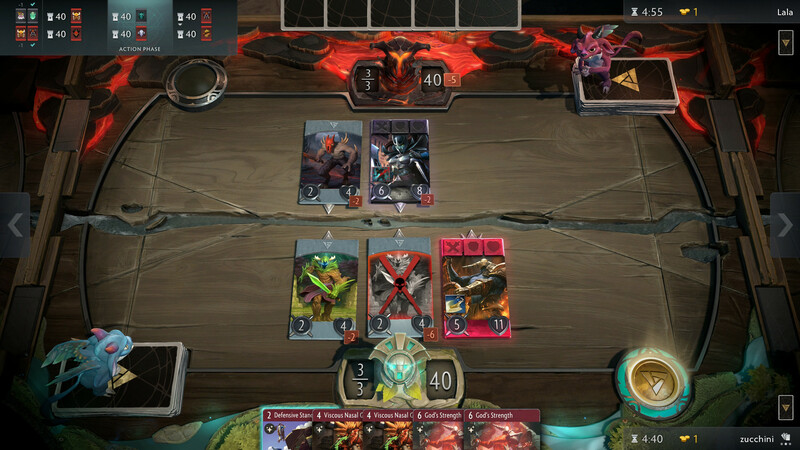 I wasn't sure what to expect when I showed up to play Artifact, but I enjoyed my time with it and am looking forward to being able to play again when the full game releases on November 28. Starter packs cost about $20, and contain two pre-made decks of 54 cards each as well as 10 sealed packs of cards. Additional packs will be available for $2 apiece, and each pack contains 12 cards. The game will only be available on Steam at first, but iOS and Android versions will release sometime in 2019.